Everywhere you turn, you hear about Amazon disrupting retail markets. Electronics, housewares, accessories and shoes. Pretty much anything you buy, Amazon has impacted that business. So what about the engagement ring and bridal market? Have they had an impact? Are they a viable option for you, the consumer? 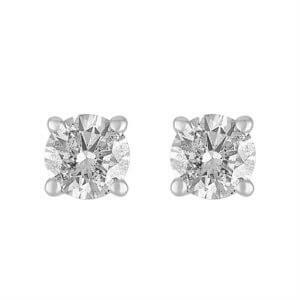 Taking a quick look you can find some nice looking stud earrings or a simple solitaire engagement ring for seemingly fantastic prices. Are these great deals or is it poor value for the customer? To answer that question we’ll take a look at what Amazon has to offer and see how it stacks up against the competition. We’ll compare products and prices, look at their site and consider how valuable service for this particular purchase. Amazon is definitely not the place to go for your engagement ring. 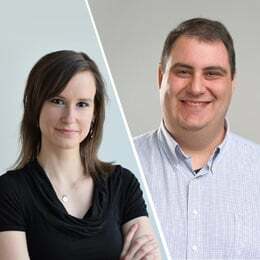 It is incredibly difficult to find the perfect ring on their site, the quality is wildly unpredictable and you get far better value at online retailers that specialize in engagement ring products like Blue Nile and James Allen. For example, this diamond and setting from Blue Nile was far superior in quality to the similar ring we purchased from Amazon, and it was still cheaper. When it comes to other diamond jewelry like stud earrings or tennis bracelets, Amazon is an interesting option. Amazon really shines when it comes to non-diamond jewelry like like cufflinks. But when it comes to engagement rings, I’d look elsewhere. Most consumers looking for a diamond are buying an engagement ring. The first issue we face is the Amazon business model trying to work for diamond rings. Amazon’s business model works really well when you are selling a product that is easily duplicated. I just looked at my previous orders on Amazon and they all fall in that category: Lightbulbs, a sous vide cooker, a cell phone case and exercise gloves. Thousands of people can order the same product and the same supplier just pulls them out of their warehouse to ship. This is not how people buy diamond rings. This is one of the most personal purchases you will ever make and you want it to be perfect. It is also one of the largest purchases most people have made at that point in their life. You search for the perfect setting, then pair it with the perfect diamond. Both of these searches, while connected, are separate. This raises two problems with Amazon’s model. Limited ability to find the right ring and inability to select the right quality diamond. 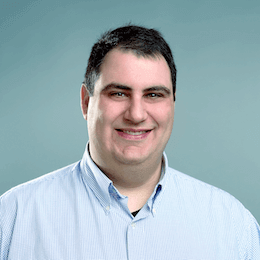 When buying a diamond ring at a proper jeweler, whether it is an online jeweler like Blue Nile or James Allen or a physical retailer in your hometown, you get to mix and match. We’ll use online retailers as they are the “competition” Amazon is facing. Step 1: Finding the setting you want. Let’s say you want a twisted pave style engagement ring with a one carat center diamond. 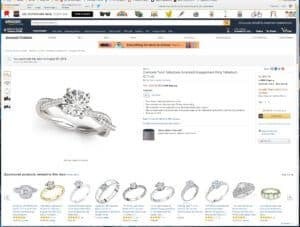 On Amazon, I searched for “Twist Engagement Rings” and used their filter for 1.00ct-1.49ct. There were roughly 150 results. That sounds like a lot, right? Well, not really. First off, you need to remove all the results that don’t have a center diamond. Of those 150 rings, 55 of them did not have a single center stone. Instead, they put a cluster of tiny diamonds in the middle. Then you have duplicates of the same style ring over and over. For example, there are 24 rings offered by the company “Allurez” that popped up in the results. In reality, they only have 2 styles there, just with different metal options. 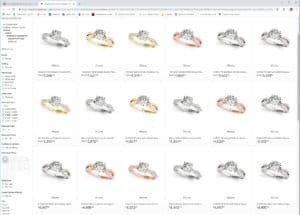 So while they have 150 results listed, there are barely any rings listed that fit the bill of “Twist engagement rings”. Now let’s take a look at Blue Nile. The same search “only” nets 44 results. But those results paint a far better picture. Of those 44, 37 of the rings listed were unique engagement ring options. For most of these settings, you can choose from multiple metal options. Many of the rings are able to be set with different diamond shapes as well. 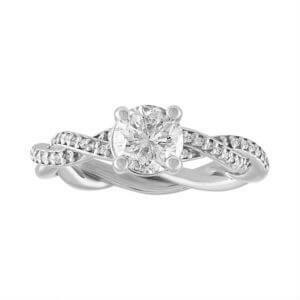 Take this Petite Twist Diamond Engagement Ring for example. If you open it up, you can see that there are two different metal options and the diamond can be set with eight different diamond shapes. You can truly tailor the ring to your personal preferences. As you can see, the search results were a little misleading. Amazon’s “150” results turned out to be closer to 15 to 20 different options while Blue Nile’s “44” results gave you hundreds of different permutations. Not only do you have more options, but it was far easier to search for a specific style. Step 2: Getting the right diamond. Now we get to the second half of the equation. Finding the right diamond to put in that perfect setting you’ve found. This is where Amazon desperately needs to pick up its game. Let’s say you were not deterred by the poor selection, or inability to properly filter your results and settled on one particular setting. Let’s use the pave twist setting from Allurez that we mentioned above. Take a look at the ring itself. It looks fantastic. There is just one problem. That is not the exact ring you are getting. See, they offer that ring style, but they don’t tell you exactly which diamond you are getting. They tell you that they will add a diamond in the “G-H” “Si1-Si2” range. There are loads of problems with offering something like that. First off, they don’t say anything about about cut quality, which is very important (you can read more here). They don’t mention fluorescence (which can impact the price of the diamond) and they don’t even mention which certificate the diamond comes with (not all certificates are equal as we explain here). Second off, that is a range of qualities with a pretty wide array of price points. If you couple that vagueness with the issues I just mentioned, there is no way to figure out if that ring is a good deal. Let’s use a couple of diamonds as examples. First I found a similar twist pave setting on James Allen. If you look at it, you will see that it is better quality (gold vs palladium, higher carat weight etc). Now let’s look at a couple of diamonds. This first diamond is an H SI2, so it falls in the range that Allurez was offering through Amazon. However, the diamond has ugly inclusions and is certified by IGI (we recommend GIA or AGS certificates only). This diamond is $3,190. Now let’s take a look at this G SI1 diamond that costs $5,980. This diamond is far superior to the other James Allen diamond (better cut, color, clarity and certificate). Also, take a look at this search on James Allen. It allows you to filter and sort your information any way you need. 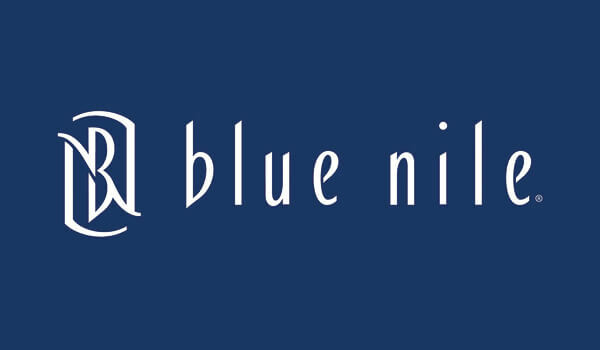 They, like Blue Nile, also offer high quality diamond images so you can see the diamond before purchasing. So if you were buying on Amazon, how exactly are you supposed to find the right diamond. You can’t search for your particular quality preferences and you can’t be sure exactly what quality you are getting. Back to that Allurez ring, is it a lower quality diamond and a terrible deal? Or is it a better quality diamond that may be worthwhile? There is no way to know, so we decided to secret shop them. And that is exactly what we did. The only way to describe the engagement ring that I purchased from Amazon is a train wreck. I tried to be as fair as possible when picking the ring to order, but what I received was an enormous disappointment. The ring I went with was supposed to be a 1ct GH color, SI1/2 clarity diamond in a twisted pave ring (you can see the product here). They were charging $5,066 for the ring. What I received was far below the qualities the supplier promised. While the color wasn’t bad, the clarity was at least 4 grades lower than the range they claimed (in my opinion, it was an I3 at best). You can see in the image (of the actual ring we received) that the diamond is completely covered with grey, cloud-like imperfections. I showed the ring to a colleague of mine in the diamond industry and we both agreed that no diamond expert would buy this diamond for $1,000. Fortunately, the supplier did accept the return right away, as I was not looking forward to losing $4,000 while conducting research for this article. Had the diamond from Amazon been up to quality they claimed, the rings would have been fair deals. Take a look at this diamond from James Allen and this diamond from Blue Nile. Both of these diamonds are GIA certified. Both companies offer similar setting styles that are superior (white gold instead of palladium). Here is petite pave ring from James Allen and a twist diamond engagement ring from Blue Nile. Both James Allen and Blue Nile, came in about 5% cheaper than the offer at Amazon. Normally that isn’t a huge difference, but given the vastly inferior quality of the diamond from Amazon, it became a no-brainer. They shouldn’t even have been in the same ballpark. I wasn’t able to compare the quality of the actual Amazon ring I received to offers from James Allen or Blue Nile, because neither of those companies offer something of such poor quality. Normally we try to order the same quality for all companies when comparing stud earrings. Unfortunately, Amazon did not have the specific quality that we ordered for other companies. Instead we went with these ½ ctw stud earrings that were lower quality. I was genuinely impressed with the look and quality of the diamonds. Yes they were lower quality (you can’t see most of the inclusions when its not magnified) than we normally recommend, but they were exactly the quality they claimed to be. While I wouldn’t recommend this quality to our readers, if you really want to maximize the size for your budget, these are an interesting alternative. The packaging was a little sub-par compared to Blue Nile and James Allen, but it was acceptable. And the return was super easy. You can read more about how they stacked up against the competition in our Diamond Stud Article. We did not have a chance to secret shop their tennis bracelets but based on my research, they have some pretty good offerings, similar to their stud earrings. This 2ctw prong set tennis bracelet for example looks fantastic to me. It is comparable to this offering from Blue Nile. You can read more about it in our Tennis Bracelet Guide. This is the type of jewelry that Amazon will excel at. There is not as much of an issue when it comes to quality (like you have with diamonds) and their sheer size allows them to offer loads of options from this classic set to something a little more funky like these. You can read more in our Cufflinks Buying Guide.